Al Jolson epitomizes the American entertainment business in the first half of the 20th Century. In fact, he was often billed as "The World's Greatest Entertainer" even before his game-changing appearance in the first successful talking picture The Jazz Singer in 1927. Seemingly born to entertain, Jolson performed before the troops in World War II, and enjoyed a resurgeance of popularity when two film biographies were released just prior to his death in 1950. Born into a Jewish household in Lithuania, Jolson's father emmigrated to America when Asa was only five. By 1894, Moses Yoelson had become the cantor at Talmud Torah Congragation in Washington D.C., and had brought his family over. Unhappily, Asa's mother Naomi died the following year, causing a great sadness in the young lad, which was relieved by his discovery, along with his brother Harry, of — showbiz! Asa and Harry began singing for tips on street corners, and attending vaudeville shows. Asa's singing got him gigs at the circus, in burlesque and vaudeville. Soon he and Harry were being handled by the William Morris Agency. Teaming up with Joe Plamer, Al began signing Afro-American material in blackface, which became his trademark of a kind; Jolson has been credited with introducing white audiences to Black music. In 1905, Harry left the act, and in 1906, Palmer and Jolson had split. Jolson spent some time singing in post-earthquake San Francisco, then returned to New York, where he did his blackface routine in Dockstader's Minstrels. Signed by J.J. Schubert, Jolson was cast in La Belle Paree at the Winter Garden Theatre on Broadway in 1911, and became an immediate star. An amazing ascendenacy followed, with the Schubert's mounting shows for Jolson, who by this time had created a blackface character named "Gus"; by the time Robinson Crusoe, Jr. opened in 1916, with Jolson playing Good Friday in blackface, he was making $2,000 per week. Jolson toured in Crusoe, Jr. extensively. The 1918 Broadway show Sindad provided Jolson with his enduring songs, "My Mammy" by Young, Lewis, and Donaldson, and "Swanee" by Caesar and Gershwin. Jolson was the biggest star on Broadway; recordings made him an international star. The Schubert's built and named a theatre after him. Many hits followed. Al Jolson had been filmed signing for the Vitaphone short A Plantation Act (released in October, 1926). 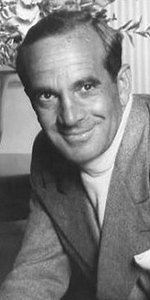 After seeing Jolson perform in Robinson Crusoe, Jr., writer Sam Raphelson was inspired to write a story which would eventually become the Warner Bros. talkieThe Jazz Singer, in which Jolson starred (released in October, 1927), electrifying audiences who had never seen anything like it before at the movies. The form changed forever. Warners' put Jolson into the mill, producing The Singing Fool (released in September, 1929), Mammy (released in March, 1930), and Big Boy (released in September, 1930). Jolson returned to New York breifly, then returned to the cameras for Lewis Milestone's Hallelujah, I'm a Bum (released in February, 1933). Jolson returned to form in Wonder Bar (released in March, 1934) and Go Into Your Dance (released in April, 1935). Jolson's last film for Warner Bros., The Singing Kid, was in the can and ready for its release in April, when Sid Grauman asked him to do the usual hand and footprints (and also kneeprints) in March 1936. Moving over to 20th Century-Fox, Jolson co-starred in Rose of Washington Sqaure (released in May, 1939) and also had a second-banana role in Swanee River (which played the Chinese in December, 1939). World War II brought the dejected Jolson out of his doledrums: he became the first American entertainer to perform before troops in uniforn beginning in early 1942, and continued throughout the war, contracting maleria and loosing a lung in the process. Jolson played himself in the George Gershwin biopic Rhapsody in Blue (released in September, 1945), then dubbed for actor Larry Parks, who played Jolson in the biopic The Jolson Story (released in October, 1946) and Jolson Sings Again (released in August, 1949). Jolson had lept at the chance to perform before troops in Korea. He was hoping to star in a film about USO tours in the South Pacific at R-K-O called Stars and Stripes Forever, but Jolson suffered a fatal heart attack while playing cards with friends in San Francisco at the age of 64. His son was given the Medal of Merit for his father's tireless efforts two months after Jolson's death by defense secretary George Marshall. Grauman's Chinese Theatre, Hollywood, California. Al Jolson Forecourt ceremony, Friday, March 12, 1936. 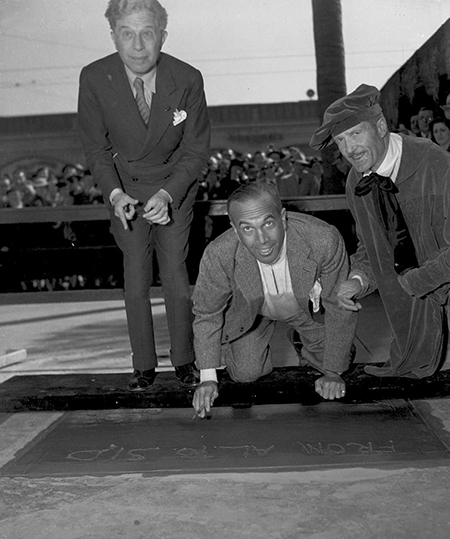 Al Jolson is assisted in making his footprints by Sid Grauman and cement artist Jean Klossner.